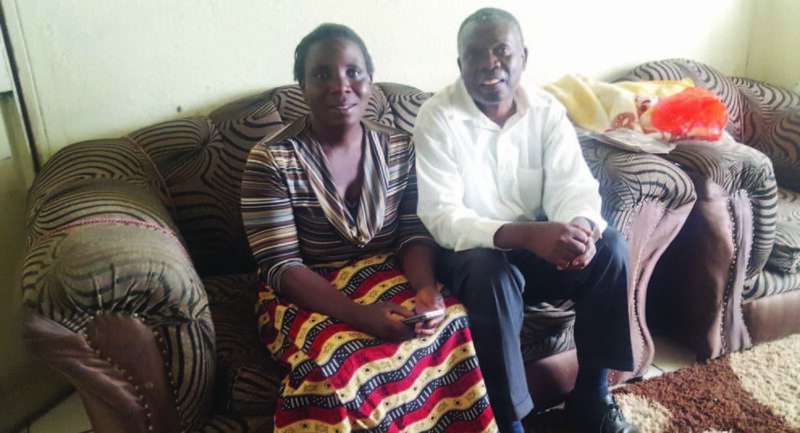 DAVID Mphande has not regretted the decision he made when he married Grace Njobvu, 28, years ago. Now with four children, David says Grace is the best gift God has blessed him with. Grace shares the same thought,” I have enjoyed my marriage from the first day. For me, it was an answered prayer because my husband meets every quality I was looking for in a husband,” she says. David’s prayer is that his marriage becomes a shining example to many people in his community. He believes that marriage is a good thing because two people are better than one. David says people who are not in marriage are missing out on good things. “My prayer is that God continues seeing us through till the time he is going to take us. Our life as a couple must be a witness to other people. We are like a light on the mountain where people should come for counselling ,” David says. Grace wanted to get married to a God fearing man as she was growing up and getting married to David is a dream come true. Though David frequently visited her grandmother’s place in 1989, it never crossed Grace’s mind that the two would later get married. “He was doing evangelism with my brother and would frequently visit. I did not have an idea. I took him like my brother also because he was a friend to my older brother Robbie,” Grace says. During his frequent visits, David began to develop interest in Grace and began to monitor her behaviour. “I used to go in the field with her older brother after that, we would have lunch at his grandmother’s home. I started noticing that she was a humble, respectful and well-behaved girl,” he says. She was in Grade Eight at the time David asked for her handmarriage and therefore thought she was too young to get married. Thanks to Grace grandmother’s influence, Grace dropped out of school and agreed to David’s proposal. The two got married in 1990. “My grandmother knew David’s family background. She advised me to get married to him because he was from a respected home,” she says. David says he treasures his wife so much that he has never laid his hand on her for the 28 years they have been together. “My wife is precious, good and above my rib. I believed that we could build a good family together. She never had a bad record in her neighbourhood,” he says. David says people in marriage must resolve their issues between them and not take them in public domain for discussion. Grace on the other hand is of the view that submission is key to keeping a marriage firm, especially on the part of a woman. “Submission is very cardinal on the part of a woman, even the Bible demands that a woman respects her husband. Lack of submission has led to some marriages breaking down,” she says. Grace says a woman must always humble herself before her husband, regardless of the qualification or status she has obtained. David says people in a marriage must believe in God if their marriages are to succeed. “A couple should acknowledge that God is the ruler of their marriage because he is the author. A couple must also pray together to avoid giving chance to the devil,” he says. David advises young people to go through counselling before they get into marriage. Grace does not subscribe to the public perception that marriage is a “shipikisha club” because it was given to man to enjoy. “I wonder at times when I hear people complain that they are experiencing problems in their marriages. Women need to fear God and respect their husbands to avoid problems in marriages,” she says. Grace says issues of finances must be handled with care because they contribute to problems in marriage. David says misunderstandings are normal in marriages but there should be a proper way to resolve them. He says divorces have become common nowadays because of lack of trust among couples. “People planning to go into marriage must plan in a lot of areas for their marriage to be strong. People going into marriage must prepare financially, spiritually and materially,” David says. Grace says young people must prepare for both good and bad times when going into marriage. She says life has stages and people going into marriage must not only look out for good times. “Women must be entrepreneurial and help their husbands with issues of finances. A woman must also support her husband in an event that he loses his job,” grace says. David is also a pastor and together with his wife, they are involved in small scale farming.